Recently I ran a series of innovation and business development workshops for a group of geoscientists. 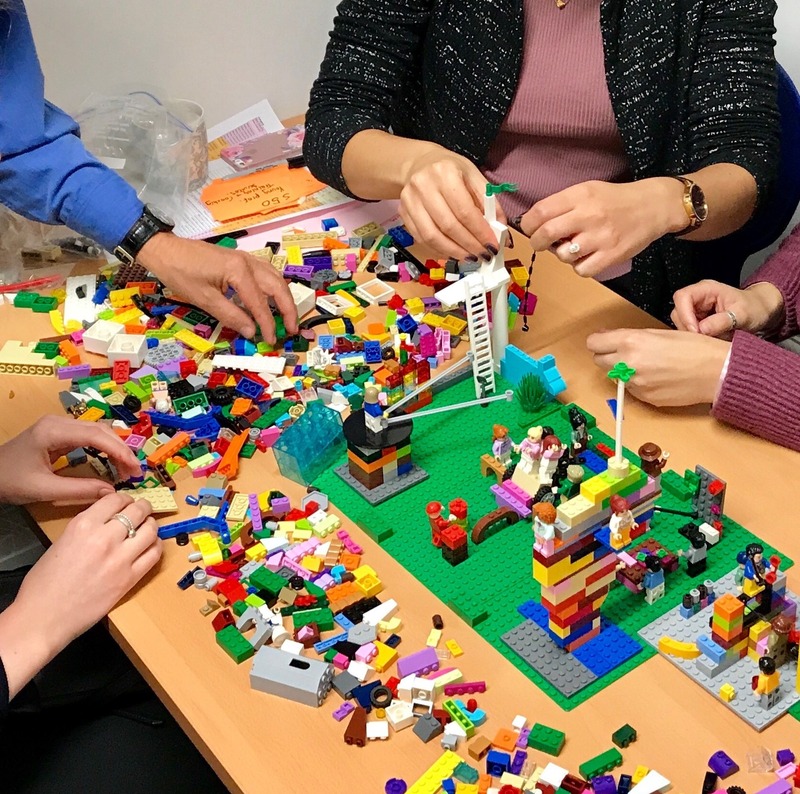 Having previously experimented with toys to solve business problems, and seeing how well the group responded to the creative challenges I’d set to harness their collective wisdom and imagination, it was time to try something new: LEGO Serious Play. In this post I’d like to share with you how it went! 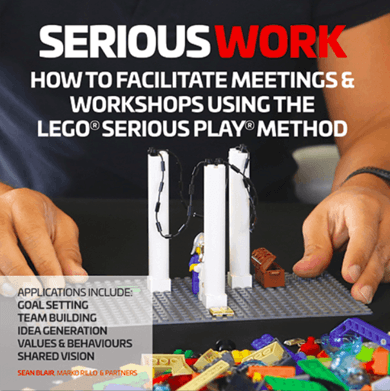 LEGO Serious Play – or LSP for short – is a proven methodology based on insights from neuroscience, first developed in the early 2000s by LEGO’s Education division and IMD Business School (the method has since been open-sourced). Roughly 80% of our brain cells are supposedly connected to our hands, so the theory goes that we can unlock hidden knowledge and make new connections by using our hands to build LEGO models. Playing with LEGO is fun, of course, but that alone won’t necessarily produce useful results. What is unique about LSP is that it uses a defined and facilitated process where LEGO models act as metaphors for storytelling. 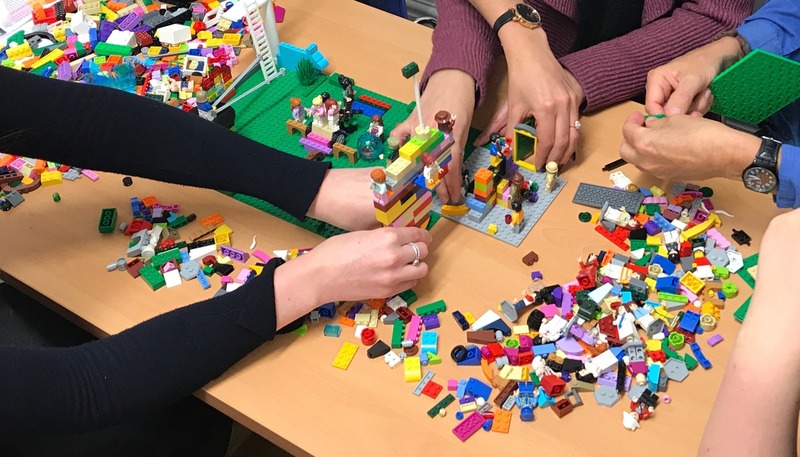 More than just playing with bricks and hoping for inspiration, it’s a bit like play therapy – enabling people to express themselves through the medium of LEGO. After all, even just six standard bricks can be combined in almost 1 billion different ways, so the potential for expression is infinite. Some people liken it to “3D printing your thoughts”. Readers who know me simply as an information management consultant might be surprised to see this post. I’d been itching to try LEGO Serious Play in a professional setting for some time, and was glad to finally have the chance. Below I’m going to describe what we did, how it went, and provide some reflections that will hopefully inspire you. For further information check out the references at the end. At this point I would also like to thank Patrizia Bertini of LegoViews who introduced me to LEGO Serious Play. This particular workshop session was about crafting a unique value proposition, and was scheduled to take up to 75 minutes. 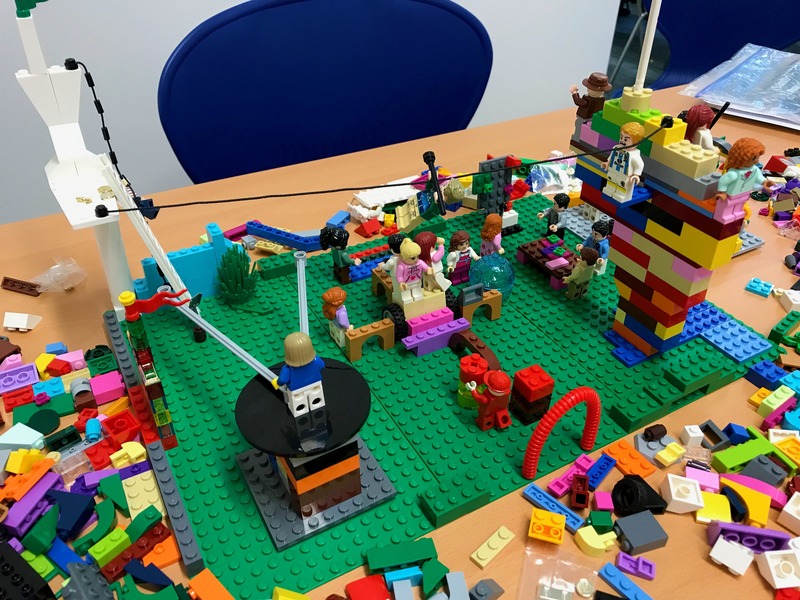 First, I needed a volunteer team of 4-6 people willing to try Lego Serious Play whilst the rest of the 25-strong group would get on with more traditional gamestorm activities involving drawings, flip charts and mood boards. I shouldn’t have worried: all 25 hands went up, meaning we had to draw lots. Sadly, I didn’t have enough LEGO bricks for everyone, leaving a lot of people disappointed! Lesson 1: Everyone loves LEGO. Next, I spent about 20 minutes with the LSP group on warm-up. In that time, I asked everyone to build a series of challenges designed to gradually acquaint participants with the method. At this stage we already discovered our first insight: everyone’s interpretation of simple instructions like “build a tower in 30 seconds” was very different and unique. Lesson 2: LEGO naturally extracts unique and original contributions from every participant. Many people freak out when asked to do something “creative”, like drawing. In such cases you first have to do a few exercises to remind people that they can actually draw. Most adults don’t regard themselves as being creative, which is a shame (young children have no such qualms, presumably because they don’t measure themselves against Michelangelo). With LEGO, though, no freak-outs occurred. On the contrary: people were lapping it up and just went for it. Lesson 3: With LSP, participants do not need to think of themselves as “creative”, or have any special LEGO building skills. 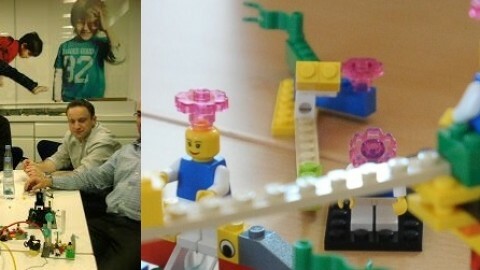 In the warm-up we also introduced the concept of using LEGO models as metaphors, which is key to the LSP method. For example, I asked people to build a random model from 12 bricks and then, once they were built, made everyone explain how their model might be interpreted in terms of teamwork. Making it up as they went along, everyone was intrigued by what they discovered. In that sense, LSP shares some properties with a gamestorming technique called image-ination, which uses random images to trigger lateral ideas. Lesson 4: LEGO models can create meaning and insights that even their creators didn’t initially envisage. Now it was time to start the proper exercise and focus on the team’s unique value proposition. I asked every person to build a LEGO model that expresses how they perceive their team’s strengths versus customer needs. At this stage I was struck by how little explaining I had to do: everyone just start building straight away, without necessarily knowing where it was leading. For some reason, people were now comfortable launching themselves into the unknown, somehow trusting their hands to do the work. I was really surprised by this – a marked contrast to the other teams who, using traditional workshop methods, were initially staring at blank sheets of paper and took a while to get going. Lesson 5: A pile of LEGO bricks is less intimidating than a blank sheet of paper. In any type of meeting or workshop it is very common for dominant participants to take the lead and steer conversations in their direction, thereby silencing less assertive voices. By contrast, and even though my facilitation was deliberately light-touch, the team using LEGO did not suffer from this problem at all. Everyone was equally engaged, leaning in over the table to grab bricks and build their own model to express their viewpoint. Lesson 6: LEGO Serious Play levels the playing field, enabling every participant to engage fully and equally. Once people had finished building their models, we went around the table so everyone could explain the meaning of their creation to the rest of the group. Now I was really struck by how intently people were listening to each other – they were leaning in closer to inspect the model, their faces expressed sincere curiosity, there were many smiles, and even spontaneous applause. Also, while people were listening to the speaker they were instinctively looking at the model rather than the person, making introverted members of the group more comfortable opening up. Lesson 7: LSP creates a safe environment where everyone is listened to. The next step was to combine the individual LEGO models into an overarching group model that represented the whole team’s perspective. The team didn’t have enough time to merge, tweak or reform the models in a major way, so this mostly ended up as a collection of individual models. But it was interesting to see how participants instinctively grabbed connecting pieces to join up ideas between models – without any prompting from me as facilitator. For example, they put a zipwire between two different models representing expertise and geographical reach, realising there might be specific opportunities in particular regions of the world. 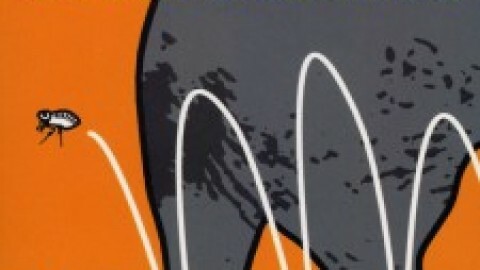 Lesson 8: LSP naturally and instinctively lends itself to making connections between ideas. What was also remarkable is how good the models were at aiding memory. Even days later, looking back at the pictures, I still remembered what each of the LEGO models represented – even though, to an outside observer, they would have looked like a random and meaningless jumble of constructions. And even though, as facilitator, I wasn’t involved in the actual building of the models. Lesson 9: Physical models help you remember the stories they represent. 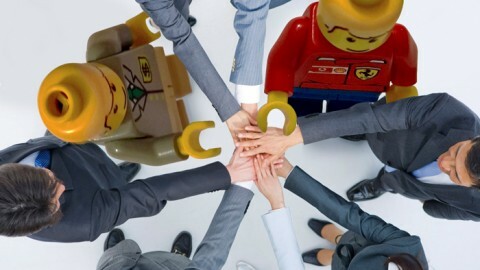 The final LEGO model highlighted common strengths found in individual models, as well as unique contributions from each team member. For example, the prevailing theme was about being multidisciplinary, flexible, agile, and offering customer relationships with a personal touch. This was complemented by more unique contributions from individual team members, including services to improve customers’ skills and help them make sense of their data. All of this, and more, was inherent in the final LEGO model. With more time we could have gone deeper but, having spent just over an hour, we were unanimously pleased with the result. From a vast array of possibilities and potential services it had clarified and crystallised the team’s understanding of what they’re really about. Because everyone had contributed in equal measure, the LSP method gave us a high degree of confidence that the result was truly representative of the team’s collective understanding, built up from diverse viewpoints and personalities. In that sense, LSP seems ideal for minimising the risk of blind spots. LEGO turned out to be a very intuitive medium because of its physical and very hands-on properties. And, of course, everyone remembers it from their childhood. There is no need to pre-think ideas: just start building. 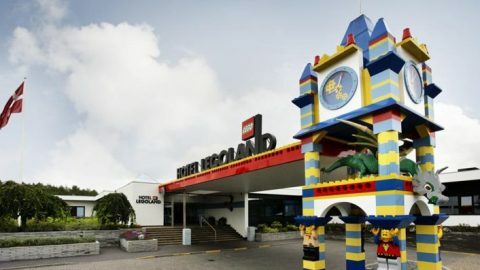 Also, it felt like LEGO’s additional dimension, in terms being 3D rather than 2D, afforded more – or at least different – opportunities for discovering insights and making lateral connections. As with any method, there are pros and cons. Unless people have had prior experience with LSP, it’s probably not the best method if you quickly or spontaneously want to explore some thoughts. Warm-up is essential, otherwise people might just build literal representations of physical objects – which misses the point, as metaphors can convey much deeper meaning (I experienced this problem myself when I first started experimenting with LEGO to clarify my own thoughts). Having said that, LSP warm-up could double up as an excellent icebreaker for any workshop, thereby recouping the initial time investment. Finally, one thing to keep in mind is that you probably need at least a couple of hundred LEGO bricks per person, including a selection of mini-figures, a pile of standard bricks, and a good variety of more unusual bricks that lend themselves well to metaphors. You can buy special kits for LSP or make up your own (I used a combination of both). But if you’re going to facilitate a workshop for more than 10 people, you probably need a separate suitcase just for the LEGO! And, last but not least, there were lots of smiles! The exercise left everyone energised and inspired. This aspect should not be underestimated. Staff motivation can be a huge driving force in company productivity and results. 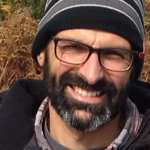 Even as facilitator I felt a real buzz – and that was without touching a single LEGO brick! 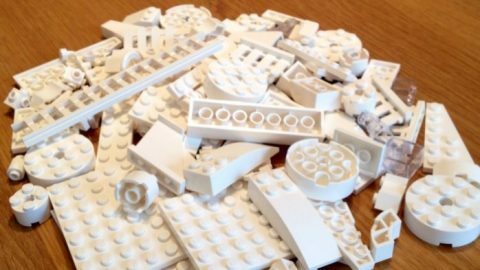 LEGO Serious Play proved itself as a highly intuitive and accessible method, which made people comfortable with embracing the unknown. 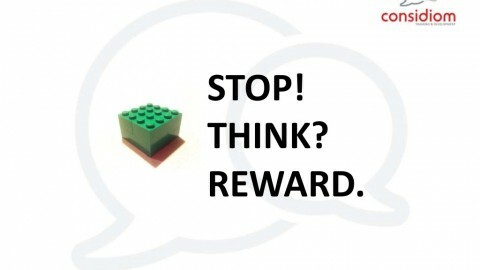 Or is it simply that, to embrace LEGO as a credible workshop methodology, you need an open mind in the first place? I hope not. When work feels like play, the results speak for themselves. LSP has been successfully applied around the world, from small groups to major multinationals. Still, I can easily imagine “serious” business people feeling resistance to LEGO as a serious business tool. If you have read this far, I hope it will inspire you to try it for yourself. It was remarkable to see how the process levelled the playing field, ensuring everyone was fully and equally engaged. We were all captivated by the results. And, seeing how everybody enjoyed themselves, it clearly felt good. After all, who doesn’t like working with their hands? From fixing a bike to making pottery or building a garden shed, using our hands to solve problems is instinctively satisfying – something we as digital knowledge workers sometimes forget. Reflecting on this exercise, I feel that the experience has shown yet again that we have increasingly lost the human and physical touch in the modern workplace (as I previously commented on digital transformation). 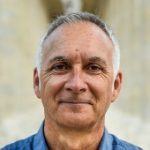 Technology has brought enormous benefits to society, but there is also an increasing realisation that we as humans need more than computer screens, emails and bland meetings to be happy and productive. Playing seriously with LEGO can help reinstate some of those missing elements. And with reputable institutions like Cambridge University creating roles like Professor of Play – yep, it’s a real job! – we can only hope that playing at work might become a common practice in the future. Let’s do this… who’s in? 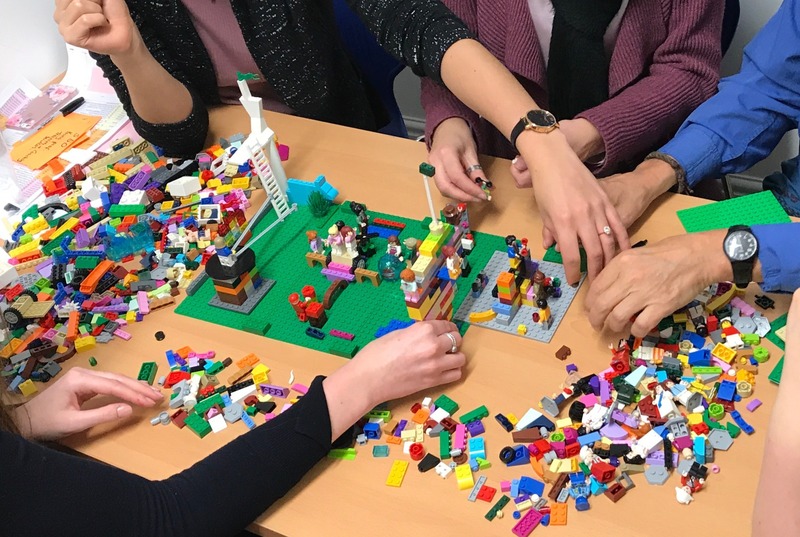 If you’d like to try LEGO Serious Play drop me a line, I’m looking for volunteers to give it a go particularly in the domain of (geo) information management and workflow design. If you’re up for a bit of fun and experimentation, we could both learn something! What a manifesto ! I generally refrain from expressing my personal satisfaction when reading a good article but yours is so enlightening. It has everything. 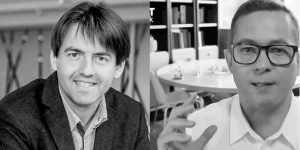 From the different powerful lessons to the reflection on digital transformation.